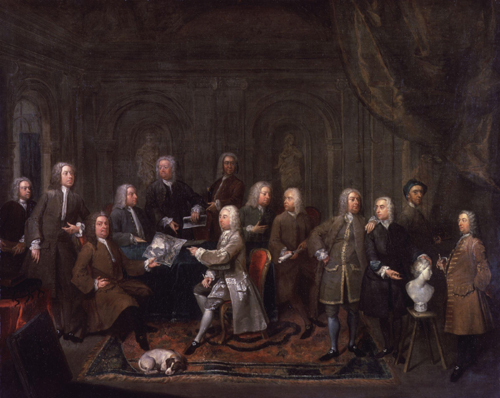 In 1715 the Scottish architect, Colen Campbell, launched his campaign for a return to the purity which he believed to have been the quality of the antique. In the preface to the first volume of his Vitruvius Britannicus he praised Andrea Palladio and placed great emphasis on simplicity and on proportion. 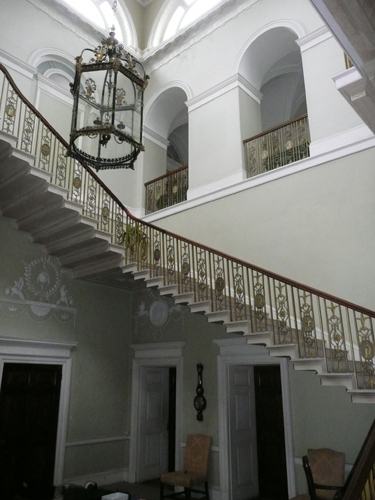 Throughout much of the eighteenth century the entrance hall (and to an extent, the staircase too) was regarded as being a semi-external space. This had a bearing on both the furnishing of the room and the colouring of the walls. Note, for example, how the seating in the images above is not upholstered and the decoration fairly sparse. Common Colours. The paint was sometimes sanded1 to suggest stone. 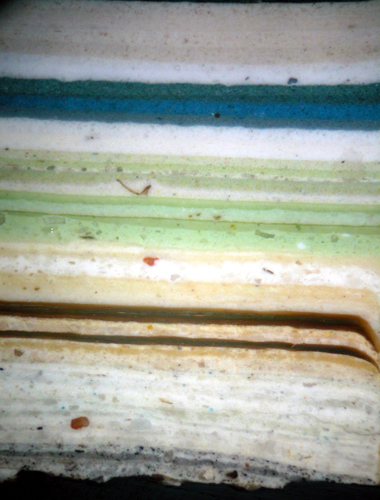 A cross section of paint from the entrance hall of Roehampton House. The transition from darker to lighter colours has been seen clearly in the stratigraphy when looking at the paint of several houses of the early eighteenth century. 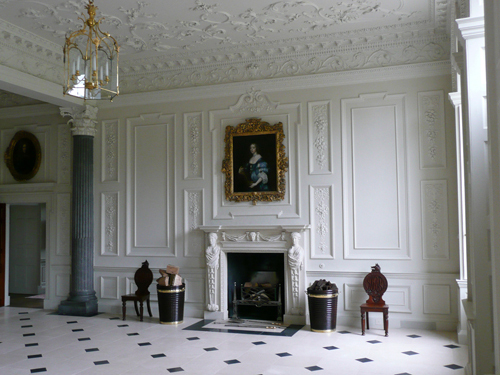 As will be seen below, for example, the evidence suggests that the entrance hall at Roehampton House (1712) and the South Hall at Wilbury (1710) both adopted paler stone colours in the 1730s having originally been painted in darker colours of different kinds. Whereas at the beginning of the century darker colours, such as olive green and drab, had been considered fashionable and finishes tended to have a high level of sheen, within thirty or forty years there was a gradual introduction of a lighter palette and often in a more matt finish. Analysis of the painted surfaces in a number of eighteenth century buildings – ranging from those in London terraces to substantial country houses has confirmed the widespread use of stone-coloured paint in the entrance hall. 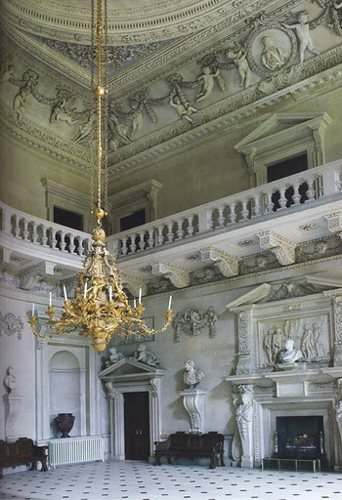 The panelling in the entrance hall was painted in a stone colour on the first two occasions. This was changed to a grey colour on the third to fifth times that the area was painted. Stone colour was readopted and employed until the ca.1830s. 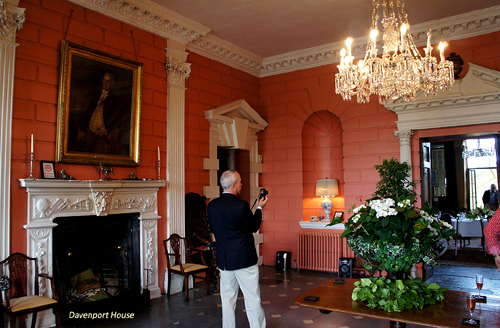 The dark colours on the panelled walls of the South Hall were replaced by off-white in the mid 1750s. At this time the original panel mouldings were prised off and the walls made flush. Papier mâché ornaments and plaster medallions were also introduced as part of the new look. The first two schemes were in a Lead Colour, a bluish-grey produced with charcoal black3 pigment in the lead white base. A cross section of paint from the walls of the entrance hall at Fawley Court. This was the fifth decorative scheme and it was very exciting to be able to identify it in cross section from the components. Throughout the 18th century the panelling of the entrance hall and stairs of Benjamin Franklin’s house was painted a mid-stone colour and given a thin uniform coat of a brown tinted glaze. The intention behind this was to produce a shiny / light-reflective and wipeable surface. Lighter stone colours, without a glaze were applied in the 19th century. 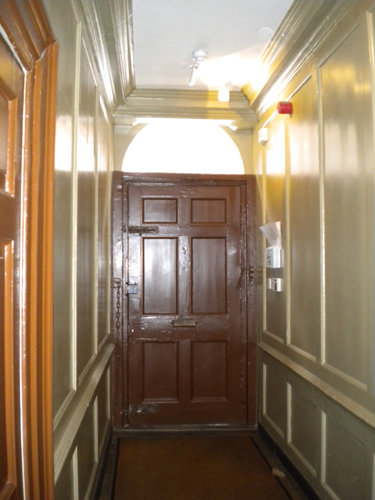 The first two schemes in the entrance hall passage were carried out in mid stone-coloured paint. The name of Sir William Chambers had been mentioned in connection with the building, but this is generally dismissed. The deal work [joinery] & stucco to walls &c. to be painted three times in oyl of a light stone colour 4 . 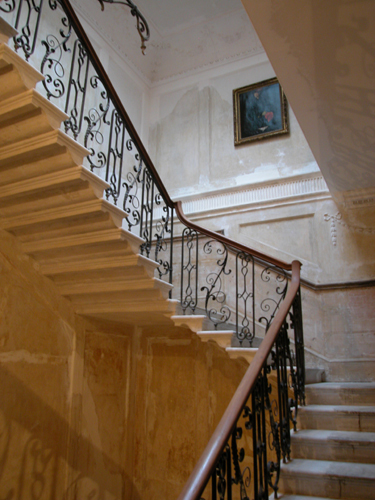 The iron work [stair balusters] to be painted of a sky blue & the doors of a chocolate colour. 1 Particles of sand were sometimes strewn onto the paint while still wet giving the texture of stone. In later years ready-mixed sand-textured paint came to be used. 2 The fact that the walls are rusticated gives a clue to the original colour. Although I have not taken samples from the house I cannot help but feel that the use of red is at odds with the architecture. 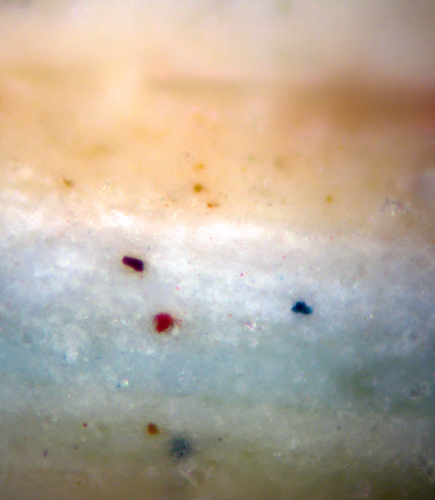 3 A pigment produced from the burning of beech or willow charcoal. It tended to imaprt a bluish-black tint to white. 4 Light, or pale, stone colour implied off-white. The grinding of lead white into linseed oil. produced an off-white colour rather than white. 5 Spruce ochre was generally considered to be a dark or dull yellow ochre. 6 Raw umber is a natural brown pigment with a high proportion of iron and manganese oxides. Papers and Paints can offer advice on the decoration of your entrance hall (18th century or otherwise).